Every day, the Korean Resource Center sees and hears from Korean American families who are in desperate need for health care. Oftentimes, the only affordable option for these hard-working parents to care for their children is through subsidized health insurance. In 2007, the health of 6.6 million children depended upon the reauthorization of the State Children's Health Insurance Program (S-CHIP) Passing both the House and Senate with wide bipartisan support, S-CHIP legislation that would expand coverage and extend the program for five years was vetoed twice by President Bush. On Dec. 29, a temporary measure was passed to merely sustain subsidized children health insurance programs until March 2009 at the current funding levels. Unfortunately, this means that 2.4 million children who are eligible but have not yet enrolled will face difficulty in accessing vital health services. This year, congressional legislators promise to renew their efforts for a long-term S-CHIP reauthorization. NAKASEC and its affiliates recognize the need to invest in the health of our future and will continue to advocate for health coverage for all children. In 2005, three workers came to YKASEC for support in gaining unpaid wages worth four months from the Uri Medical Center (Korean Medical Services). The Korean Workers Project, coordinated by YKASEC and AALDEF, filed a subsequent lawsuit and in December UMC was ordered to pay a total of $145,000. 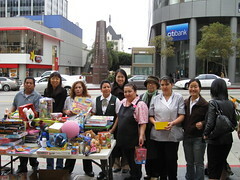 This holiday season, the Korean Resource Center organized a toy drive with other local Korean American organizations for hotel workers of the Wilshire Plaza Hotel. Workers have been fighting for the restoration of their wages, which were cut in half at the beginning of the year, and benefits that were either taken away or severely reduced KRC has been a tireless supporter for the hotel workers and their call for a boycott of Wilshire Plaza Hotel. 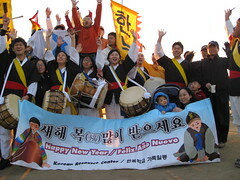 Korean Resource Center and poongmul troupe HanNuRi celebrate the rising of the sun lhyemaj/l at Griffith Park on the first day of 2008. > KRCC celebrated the end of 2007 with a volunteer appreciation dinner on Dec. 15 with great food, a poongmul performance by II Kwa Nori and small gifts to the volunteers in recognition of the thousands of hours they provide in support for KRCC programs and activities. > The Beautiful Foundation of New York awarded YKASEC one of SIX community grants on Dec. 16 for its immigrant Integration and service work.